Torrential rain on Monday, followed by perfect English summer weather for the rest of the week ensured the most fabulous going in the grass rings at Hickstead. I had rather ambitiously entered Creevagh Doonaveeragh (Finn) for all the 1m classes as soon as I got him, presuming that as the classes were already full I would be quite safe. However, wonderful Ellie Brown squeezed us in and so in slight trepidation Finn was loaded onto the lorry with Doonaveeragh Emma and Espirito Santo having previously jumped three rather small 90cm classes. With three horses to ride I had organised help for every day for the first time ever. What an enormous difference this made, and many thanks to Amber Maherloughnan, Becky Forte and Jemma Tester who groomed for me over the four days allowing me to be so much less harassed than usual. The most obvious benefit of the resulting calmness was that for about the first time ever I didn't get lost once! Click on the photos to see the complete gallery. First to jump was Espirito Santo in the Novice Stakes in Ring 2, this is my favourite Hickstead ring (after the main ring where I don't get to go very often) and he jumped a really good, and very unspooky round. Next was a leap into the unknown on Creevagh Doonaveeragh in Ring 4, I was starting to laugh as we had the first five fences down, but then the penny dropped and he was on springs for fences 6 and 7 - hopefully things could only get better. Doonaveeragh Emma jumped beautifully in the 1.25 - but I got carried away and galloped at the last fence and got a terrible stride to it. On the second day Creevagh Doonaveeragh jumped really well round a very difficult 1m class in ring 3, Espirito Santo jumped very well on the all weather and Doonaveeragh Emma jumped really well in the 1.25 in ring 2. Roll on Thursday. Another good round for Creevagh Doonaveeragh in the all weather, a really good round for Espirito Santo in Ring 3 and Doonaveeragh Emma jumped in the 1.35 Old Lodge Breeders Class. As I walked out to walk the course with Laura Kraut and David McPherson I thought I was probably seriously out of my league, but Emma was fabulous and I just had her a tiny bit close to one oxer for four faults. On Friday Espirito Santo jumped well again, Creevagh Doonaveeragh also jumped well, especially once he stopped neighing, but I expect he was pretty weary by this time. 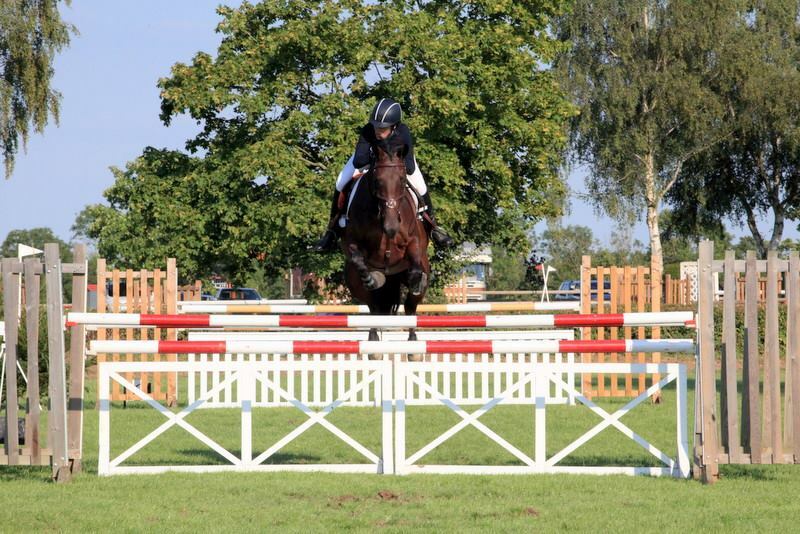 Emma then finished the week with a fabulous double clear in the 1.30, finishing just out of the money. No prizes for the whole week, but the horses had been fabulous, and I am now really looking forward to taking Emma to the CSI* at Auvers and going back to Hickstead for the AEJC in September. Many thanks to Amber, Becky and Jemma who were great company and made the week so much easier and more fun. Roll on next time.